Moms of really small children are constantly challenged by others for not putting their little ones into preschool. As a result, many feel that they have to DO SOMETHING with their children and so they fall into the trap of buying some structured programme that ends up being overwhelming, either for the child or the mom or both of them. The articles I shared last month showed some alternatives, and this month I’d like to introduce the concept of TEACHABLE MOMENTS. Likewise, we can teach our little ones all kinds of useful things, as we go about our days together. Sometimes you can plan some learning activities, but at other times, just be on the look-out for those ‘teachable moments’ – and make the most of those frequent question-answer sessions that children love to initiate. Quick and Easy Science Experiments - these were tried and tested with my kids in our own kitchen! 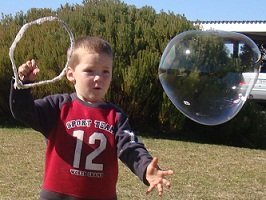 The Giant Bubbles were really fun and kept them entertained for long! Of course you can also bake and cook together. There are thousands of subscribers to this newsletter and I am sure that there are some very capable moms and caregivers amongst you who have plenty to share with others. So – I have added software to my website that enables YOU to submit your preschool ideas – crafts, experiments and other theme ideas – as web pages on my preschool site for others to enjoy. Time to PAY IT FORWARD, as they say! It is as easy as typing and will only take you a few minutes. In return for your contribution, I am offering you a free copy of my Ocean Theme Lapbook, based on the story of A House for a Hermit Crab, by Eric Carle. The following activities are aimed at ages 3-5. For older children, adapt the activity to their ability. Click here for Backissues of The Whole Child publication. To download the activities in a printable pdf, click here. You will need to have Adobe Reader installed. It’s a free download. Repeat these activities often - with your own variations too! Draw a line with chalk on the concrete outside and show your child how to run up until that line and then do a long jump. Encourage him to see how far he can jump. Encourage your child to play with wooden blocks. She should be able to build towers and maybe even try bridges, using one block to bridge the gap across two others below. Encourage her creativity. Shape perception – While your child holds his hands behind her back, place a shape in his hands and let him guess what it is by feeling its form. Use a circle, square and triangle alternatively. Read a counting book together and count the objects represented by the pictures. Invent your own games using your book, for example ask how many red objects are on a page or how many blue pictures your child can see. Tell your child a true story from your life – an incident that happened to you or a family member while growing up, things that got you in trouble, how you got out of trouble, lessons learned or humorous stories that will entertain or teach your child. Share your own prayer needs (age-appropriate ones of course) with your child and pray together. Perhaps you need healing, provision, wisdom or encouragement. Ask your child to pray for you or lead her in prayer and teach her how to pray for you. P.S. If you'd like to learn more about building an income-generating website like mine, click on the SBI banner!